The DIT software LiveGrade Pro comes with the capability to control video routers from AJA (Kumo range of routers) as well as Blackmagic Design (Video Smarthub range of routers). Video routers offer a very flexible way of connecting any signal source (e.g. camera signals, the output of LUT boxes, or playout devices) to any signal receiver (e.g. monitors, inputs of LUT boxes, hardware video scopes, or capture devices). While the integration of a video router on the DIT cart enables setups that would be hard to handle otherwise (e.g. switching between 5 camera inputs on one monitor), it also introduces a new level of complexity. All devices can now be connected to each other – and that needs to be managed by the DIT. When you’re working with LiveGrade Pro, you can reduce this complexity by setting up automatic routing changes from within the software. In the following we will discuss three typical setups in which LiveGrade Pro helps reduce complexity, and discuss how these setups can simplify and speed up the work at the DIT cart. LiveGrade Pro allows to independently control the look of multiple cameras. To do that LiveGrade Pro uses the concept of camera “slots”. For each slot you can manage devices, metadata, and looks individually, thus making the slots comparable to the independent tabs of a web browser. As a general rule, when adjusting the look in one slot, it is necessary to also view the image of that slot’s camera on a monitor. This means that if you change slots to work on a different look, you would also have to manually change the camera image you see on the monitor. If you work with multiple slots and multiple cameras, this can quickly become tedious. By using a video router and setting up the right workflow in LiveGrade Pro, you can automate this manual process. As a result, the image on the monitor would automatically follow the selected slot in LiveGrade Pro. To do so, you would create one video routing configuration for each slot that routes the camera image of the corresponding slot and camera to your monitor. You can then attach these routing configurations to “slot change” events in the software. With this setup, the moment you change slots, the routing configuration will be triggered. So if you change let’s say from slot A to slot B in the software, camera B’s signal will be automatically routed to your monitor. If you change back to slot A, you will see camera A’s image again.This means that no more manual switching has to be done. The image on the monitor always automatically follows the selected slot in LiveGrade Pro. This is the router configuration that routes the signal of camera B to the monitor. You create such a setup for each camera signal. Choose the routing configuration you previously defined as the action for the event “Switch to Slot..”. Whenever you switch to a certain slot, the corresponding router configuration will be triggered. When you are using a capture device with LiveGrade Pro, the software not only can create frame grabs and record clips of the incoming video signal. It can also extract camera metadata from the live signal. With the DIT software’s video routing configurations and a bit of extra automation, you can use one capture device to subsequently monitor image and metadata from multiple cameras within the software. 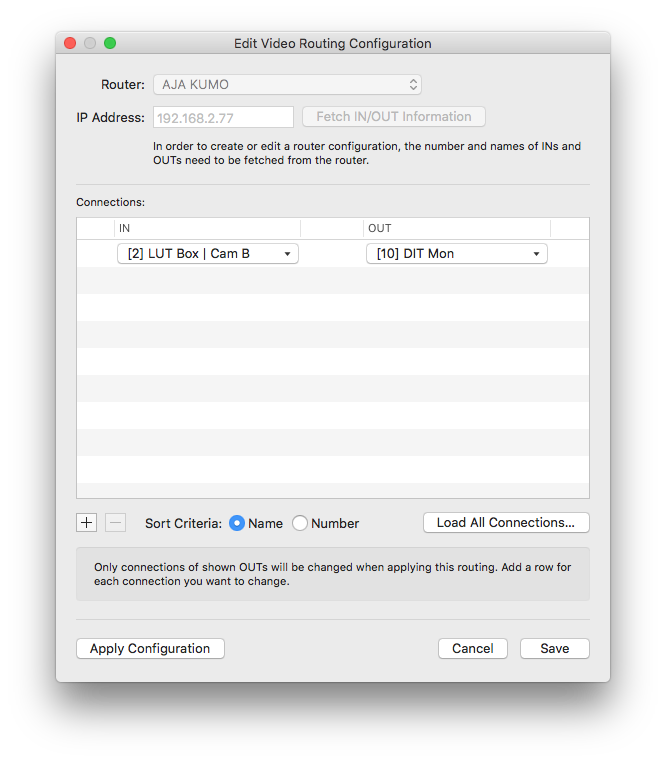 The configuration in this setup is as follows: When you change a slot in LiveGrade Pro, a router configuration is triggered that routes the corresponding camera signal to the capture device. Thus you automatically have the right signal routed to the one attached capture device. To do this, you create very similar video routing configurations as in setup 1. The difference is that this time you route the signal to the capture device instead of the monitor. The setup of the automation is the same as in setup 1. Again, you choose the new router configuration as the action for the event “Switch to Slot..”. The only thing that is missing for this setup is that the capture device needs to move from one slot to another. Usually a capture device is configured for a fixed slot, but in this setup we want the image and metadata of each camera to show up in its corresponding slot. So in that case the capture device needs to always automatically move to the current slot. You can configure this in the automation manager by using the “Move capture device to current slot” action. Now whenever you change a slot, you will get live image and live metadata (if available) of the current slot’s camera – although you only configured one capture device. 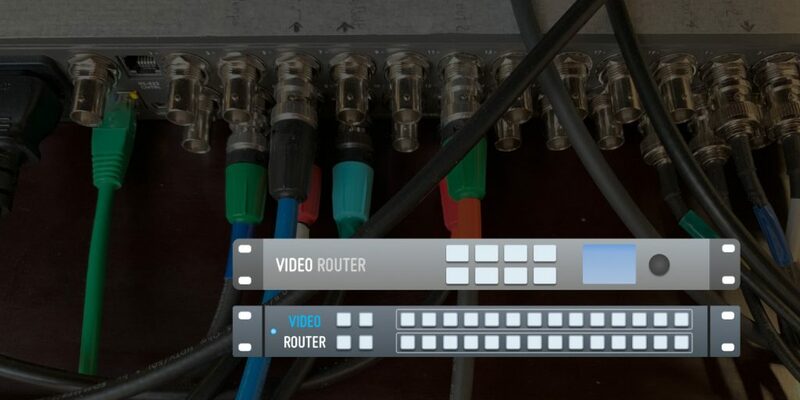 Generally the video routing configurations in LiveGrade Pro can be limited to changing just one or a few outputs of the router. This means that only the specified outputs of the router change – all other outputs remain untouched. The router configurations mentioned in the setups above are such single-output configurations. For example in setup 1 just the output that’s connected to the monitor changes – all other outputs of the router remain unchanged. With that in mind, you can imagine a broad range of configuration changes, that may not have to do with LiveGrade Pro per se, but that you may want to trigger also from LiveGrade Pro – as this is the application that’s open on your cart anyways. For this you can add keyboard shortcuts to any custom video routing configuration. With the keyboard shortcuts set, you can change certain aspects of your routing with just one keyboard stroke. Every video router configuration shows up in the main menu (under “Video Routing Configurations” in the LiveGrade Pro menu). This means you can also trigger these configurations from the menu. As a rule in LiveGrade Pro, all main menu entries can get a custom keyboard shortcut. Choose “Keyboard Shortcuts…” in the LiveGrade Pro menu and you will see a dialog showing all main menu entries and their keyboard shortcuts. The video routing configurations also show up there. You can set a new, custom keyboard shortcut by clicking “Map Keys”, selecting the video routing configuration, and pressing the desired key combination. Now your custom routing changes can be applied with the set keyboard shortcut at any time from within LiveGrade Pro. In this article we have shown three setups in LiveGrade Pro that allow for either automatic or quick manual access to video routing configurations from within the software. LiveGrade Pro integrates these configurations in different ways, so that you can tailor the software to the needs of your specific cart and project.